ANASTASIUS, an officer in the Roman Legion, inspired by the courage of the young St. Agapitus (18th August) as he endured torture, cried out: “The God of Agapitus is my God”. St. Anastasius was arrested by order of the Emperor Aurelian and put to death (274) at Salone, about twenty kilometres (twelve miles) from Palestrina, near Rome. AVITUS I of CLERMONT, the eighteenth Bishop of Clermont, and friend of St. Gregory of Tours (17th November), whom he ordained to the deaconate. St. Avitus reposed circa 600. CYRIACA (DOMINICA), (Third Century), a widow in Rome and patroness of St. Laurence of Rome (10th August), who is believed to have used her home in Rome, to give food to the poor. St. Cyriaca was martyred 249. EUPREPIUS, (First Century), according to tradition the first Bishop of Verona in the north of present-day Italy. Little that is factual is known about him, the common Veronese legend that St. Euprepius was one of the Seventy has no basis in fact. LEONTIUS the ELDER, (Sixth Century), eighth Bishop of Bordeaux, and the predecessor of St. Leontius the Younger (11th July). St. Leontius reposed circa 541. LUXORIUS, CISELLUS, and CAMERINUS, early-fourth century martyrs in Sardinia beheaded under Diocletian (303). St. Luxorius had been a soldier in the imperial army, the other two were boys whom he encouraged by him to accept martyrdom rather than renounce Christ. PATERNUS, a native of Alexandria who, while travelling through Italy, was arrested in Fondi, and reposed during his incarceration, circa 255. PRIVATUS (PRIVAT), a third century Bishop of Mende in the Languedoc. Captured by Alemanni invaders, St. Privatus was subjected to barbaric tortures in the hopes that his flock would surrender. He refused to tell them to surrender and they refused to do so, and although the invaders gave up in the face of this resistance, St. Privatus succumbed to the injuries he sustained while being tortured and reposed 260. QUADRATUS, a third century Bishop of Utica in Africa Proconsularis. St. Quadratus and his flock were subjected to severe torture, but refused to renounce Christ, and were martyred. Their constancy of faith led to them being greatly revered by their fellow Christians throughout northern Africa. SIDONIUS (APOLLINARIS), a native of Lyons, Caius Sollius Apollinaris Sidonius was a soldier, poet, diplomat, and lastly a bishop. He is one of the few Gallo-Roman aristocrats whose letters survive in quantity, leading one contemporary Antiquities scholar to call St. Sidonius “the single most important surviving author from fifth-century Gaul”. Though a wealthy, well-connected nobleman, and married to the daughter of the Emperor of the West, St. Sidonius gave his wealth to the poor. He was elected Bishop of Auvergne (Clermont, present-day Clermont-Ferrand) circa 470-472. 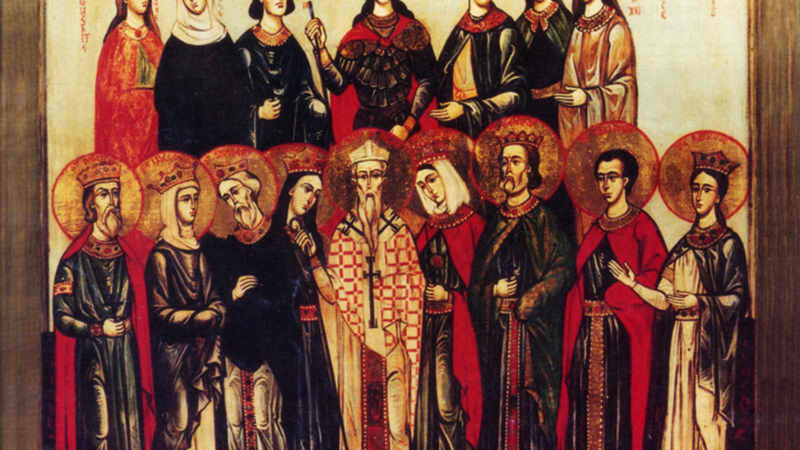 When the city was besieged by the Goths in 474, St. Sidonius took an active part in its defence, and so was imprisoned when the city was captured. However, he was soon released by order of Euric, king of the Goths, and continued to serve his flock until his repose in 480.